Creating a printed form allows you to present/collect physical forms (i.e. PDF or Word documents) to/from parents or staff, instead of having them complete the form digitally from within the dashboard. 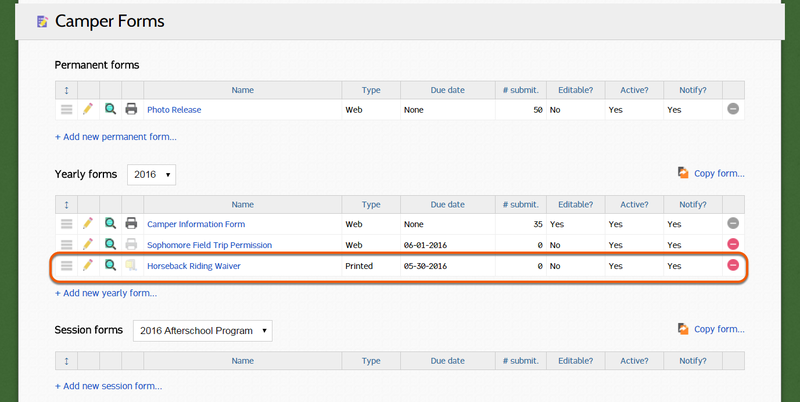 To create a new printed form, select "+Add new form..." within the appropriate scope (Permanent, Yearly, Session). Enter the name of the form. Upload the blank form. Note that parents can only upload a single file in return. If you want parents to upload a copy of their own document, do not upload a file here for them to download. Enter a due date, if applicable. Download only is useful for read only material, or forms that need to be filled out and uploaded. Choose if you would like the form to trigger the "form submission notification" for your administrative users opted-in to this notificaiton. Select if the form has any restrictions. Restrictions can be set for campers and staff appearing on, or not appearing on, a specific Advanced Report. Camper reports may be displayed during the Enrollment process. 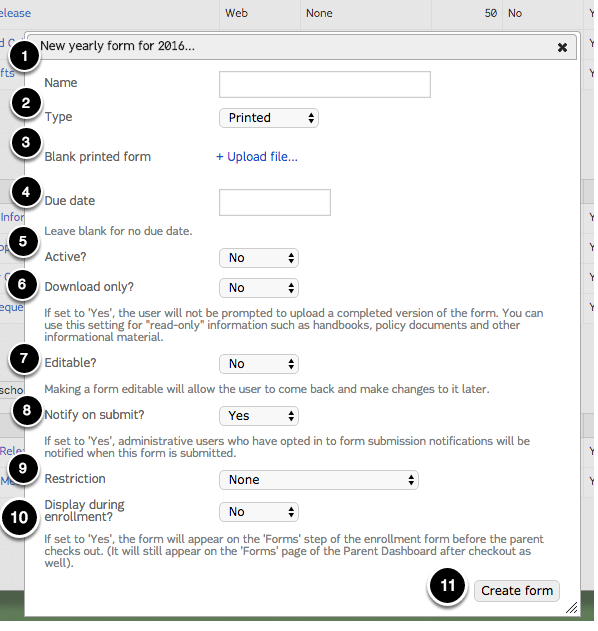 If displayed during enrollment, you will be able to choose to require the form during enrollment. Click "Create form" to save. The new form has been added to the list of forms. Click in the form name to upload a different file. Double-click the pencil to change the form settings.